In 2016, August joined June and December as the one of the three birth months represented by three gems. The original birthstone for August was Sardonyx, and then peridot was added, becoming August’s primary gem. The addition of spinel, which can be found in a variety of colors, gives August babies a plethora of options! Peridot jewelry dates back as far as the second millennium BC. These ancient Egyptian gems came from deposits on a small volcanic island in the Red Sea called Topazios, now known as St. John’s Island or Zabargad. Some historians believe that Cleopatra’s famed emerald collection may have actually been peridot. Through medieval times, people continued to confuse these two green gems. The 200-carat gems adorning one of the shrines in Germany’s Cologne Cathedral were long believed to be emeralds as well, but they are also peridots. This gemstone saw a revival in the 1990s when new deposits were discovered in Pakistan, producing some of the finest peridots ever found. Some of these “Kashmir peridots” measured more than 100 carats. The most productive peridot deposit in the world is located on the San Carlos Apache Indian Reservation in Arizona. An estimated 80 to 95 percent of the world’s peridot supply is found here. Thanks to these rich deposits, the modern demand for peridots can now be met easily, giving people born in August affordable options for wearing this beautiful green birthstone. Whether you’re shopping for an August birthday or a 16th wedding anniversary, peridot makes the perfect gift that will leave others green with envy. Peridot can be assessed with the same criteria as diamonds—using color, clarity, cut and carat weight to determine value. The finest peridots have a lovely lime green hue without any hints of brown or yellow. Quality gems have no inclusions visible to the naked eye, though dark spots may be evident under a microscope. When you look closely, due to double refraction, you may see two of each facet on a peridot. Thanks to rich deposits of peridot that were discovered in Pakistan in the 1990s, the gem is relatively inexpensive in smaller grain sizes but prices increase for larger stones. Commercially-mined peridots typically measure six to 13 millimeters, so faceted stones are generally about one carat in size. Flawless peridots over five carats are particularly rare, though stones as large as 22 carats have been cut from basalt rock in Arizona—where most of the world’s peridot is found. The world’s largest peridot is a 310-carat gem in the Smithsonian Museum in Washington, D.C.
Thankfully, there’s now enough raw material on the market so that the perfect peridot can be found to fit any taste or budget. Sard ranges in color from yellowish red to reddish brown, depending on how much iron oxide is present. Sard is easily confused with carnelian, another type of chalcedony that is slightly softer and lighter in color. Sardonyx, like onyx, shows layers of parallel bands—instead of the chaotic, curved bands that compose agate, another type of chalcedony. The finest examples of sardonyx, which display sharp contrasts between layers, are found in India. Other sources include Brazil, Germany, Czechoslovakia, Madagascar, Uruguay and the United States. Measuring 6.5 on the Mohs hardness scale, sardonyx is widely available and relatively inexpensive as gems, beads, and jewelry. It is often carved into cameos, intaglios and brooches to show the color contrast between layers. Used as a stone of strength and protection since ancient times, sardonyx is associated with courage, happiness, and clear communication. Some believe that placing sardonyx at each corner of a house will grant protection against evil. Sardonyx has been popular for centuries, dating back to the Second Dynasty of Egypt more than 4,000 years ago. Ancient Greeks and Romans went to battle wearing sardonyx talismans engraved with images of heroes and gods like Hercules and Mars. They believed the stone could harness the bravery of those figures, granting them courage, victory and protection on the battlefield. Sardonyx was a popular stone for Roman seals and signet rings that were used to imprint wax emblems on official documents—due to the fact that hot wax doesn’t stick to this stone. Sard was even mentioned in the Bible as one of the stones that adorned the High Priest’s breastplate. During Renaissance times, sardonyx was associated with eloquence. Public speakers and orators wore it to aid clear thinking and communication. Unlike rare gemstones that were historically limited to wealthy royals, sardonyx has been popular with elite and regular folk alike. Relatively common and inexpensive, sardonyx is a beautiful and powerful stone that’s affordable enough to join any collection. Sardonyx makes a great gift for people born in August who want something a little different than the traditional peridot birthstone. Readily available and relatively inexpensive, sardonyx makes an affordable addition to anyone’s collection. The qualify factors of sardonyx are not as clearly defined as other gems like diamonds, so ask an AGS jeweler for help selecting good stones. Generally, the 4Cs still apply. The most attractive sardonyx shows a high contrast between reddish layers of sard stone and white bands of onyx. It may be translucent or opaque, seldom showing flaws or fractures. Sardonyx is widely available and moderately priced in sizes up to 10 carats. The most common cut is cabochon, though it is popularly carved into cameos, intaglios, inlays, and brooches to emphasize the contrast between layers. Artificial and imitation sardonyx has been produced from common chalcedony and plain agate as far back as Roman times, according to writings from first-century naturalist, Pliny. Some gems are also stained with iron oxide pigment or treated with nitric acid to enhance color. These enhancements make stones less valuable than natural sardonyx, so watch for imitations when buying these gems. The spinel is often assumed to be other gemstones because it tends to resemble either a ruby or sapphire. In fact, some of the most famous rubies in history have turned out to be spinel. But its distinguishing features, like its octahedral crystal structure and single refraction, are what sets it apart from other gems. Spinel also has a lower Mohs hardness than ruby and sapphire. Vivid red is the most desirable color of spinel gemstones, followed by cobalt blue, bright pink and bright orange. 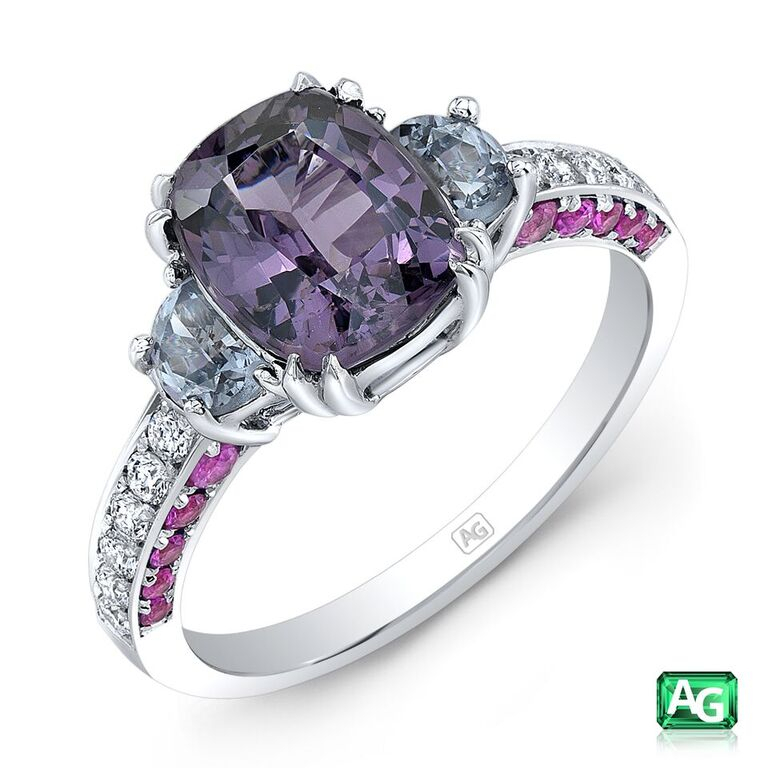 The more affordable stones are often those with paler colors, like lavender. You may also find spinel in black, violet blue, greenish blue, grayish, pale pink, mauve, yellow or brown. So many choices! When shopping for spinel, a good quality stone should have no visible inclusions. The more inclusions, the less valuable the stone. Spinel can be found in various cuts, like octagons, trillions, squares, rounds and fancy shapes, like ovals, pears, and cushions.. In the gem world, spinel could easily earn the title of “Most Underappreciated Gem.” Throughout history, spinel was often confused with ruby and sapphire. Mines of central and Southeast Asia yielded large spinel crystals known as Balas rubies, which became valuable property of emperors and kings, and often passed along as the spoils of war. Some of the most famous rubies in history have turned out to be spinel. Large red gems, such as the “Black Prince’s ruby” and the “Timur ruby” in the Crown Jewels of England have confirmed to be large red spinels. Many English monarchs, including Henry VIII, have prized spinel. It has survived them all, through attempted theft, bombings, and fires! One member of the spinel group, magnetite, has magnetic properties. As early as the 11th century, mariners used this form of spinel known as lodestone to magnetize their compasses. When it comes to color choice, spinel has a variety of choices, with some being rarer than others. The most desirable is red spinel, followed by cobalt blue, hot pink, and then vivid orange. The stones that are more affordable are paler in color, like lavender. Spinel also appears in black, violet blue, greenish blue, grayish, pale pink, mauve, yellow or brown. Spinel that is devoid of inclusions to the eye is most valuable, although some inclusions can be quite beautiful, reflecting the gemstone’s octahedral crystal growth. The spinel is a hard and durable gem and can be found in various cuts like octagons, trillions, squares, rounds and fancy shapes, like ovals, pears, and cushions. This makes spinel ideal for almost any type of jewelry!